A balloon tether is simply a balloon which is tied to the ground with ropes but can sometimes still ascend to a low altitude. Since the balloon is tied to the ground it does not leave the area with the wind as it does in normal flight. A balloon tether is ideal for parties or advertising purposes. It is a great method to use to be able to give a taste of flight to a larger group of passengers. 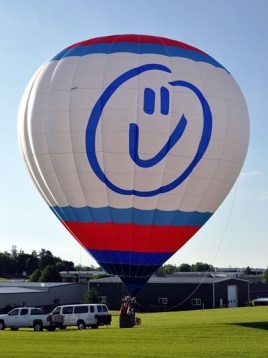 The balloon can make multiple ascents changing passengers each time. Use a balloon tether to make a party or corporate function truly spectacular. A tether is also a great way to bring an advertising message directly to a desired audience. A seven story tall hot air balloon attracts attention in a hugely positive fashion. Tethering a balloon requires a minimum area of 200 feet X 200 feet clear of obstacles and obstructions and as far as possible from powerlines. We will probably want to inspect a sight to verify the potential. The weather requirements are similar to that for flying with the best potential for success being in the morning and evening.